Jack in the Box has a new sirloin sandwich called the Sirloin Steak Melt. The Melt features slices of marinated sirloin steak and American, cheddar, and Swiss-style cheese topped with grilled onions and peppercorn mayo on grilled sourdough bread. "Our new melt has everything our guests crave – sirloin steak, lots of cheese and our grilled sourdough bread," said Teka O'Rourke, director of menu marketing and promotions for Jack in the Box. "It's an incredibly satisfying, indulgent sandwich with very broad appeal." 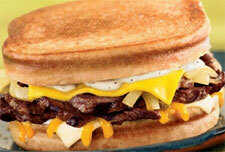 The Sirloin Steak Melt sells for $3.99 at participating Jack in the Box restaurants. Jack's Sirloin Steak Melt has 640 calories, 360 calories from fat, 40 grams total fat, 13 grams saturated fat, 2 grams trans fat, 100 mg cholesterol, 1490 mg sodium, 34 grams carbohydrates, 2 grams fiber, 4 grams sugars, and 36 grams protein.